Spend your summer at Villa Rosa where romance will blossom! Four stories of love set against a beautiful backdrop! Her Pregnancy Bombshell by Liz Fielding Miranda Marlowe must face the truth: she's pregnant! She knows well enough that her boss, Cleve Finch, is still grieving for his late wife, so to think, she heads to Villa Rosa. But when Cleve offers Miranda a convenient marriage will she find herself wanting more? The Mysterious Italian Houseguest by Scarlet Wilson Italian movie star Javier Russo needs to escape his Hollywood life. Villa Rosa is the perfect retreat. What he didn't expect was having to share his peaceful hideaway with the infuriatingly beautiful Portia Marlowe! And soon there's nowhere to hide from their simmering chemistry! The Runaway Bride and the Billionaire by Kate Hardy Immi Marlowe ran away after she was jilted... and on arrival on Isola dei Fiore gorgeous billionaire Matt Stark sweeps her off her feet! On the island's golden beaches they really connect but, when her past secrets are revealed, what will Matt do to prove they can go the distance? 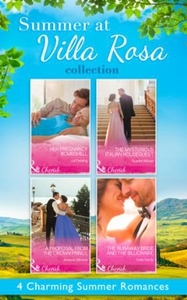 A Proposal from the Crown Prince by Jessica Gilmore Her dreams of making principal dancer dashed, Posy Marlowe escapes to her beloved Villa Rosa. However, her peace is shattered by the arrival of a gorgeous stranger on her private beach! But he's more than just stranger, he's a Crown Prince and ready to sweep Posy off her feet.